It’s sometimes the unplanned moments that work out to be the best ones in your day. 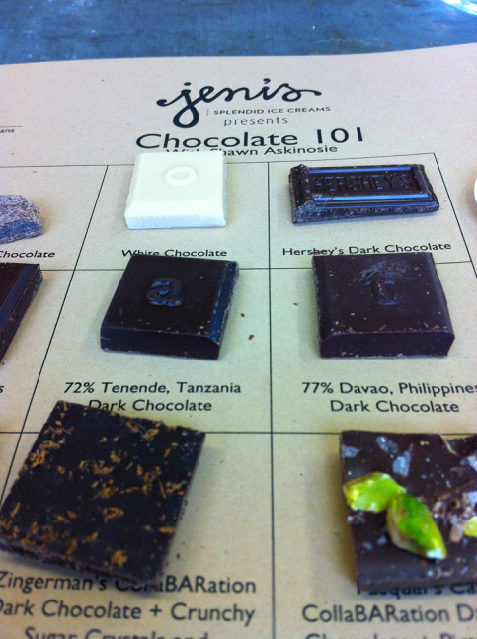 Take the morning e-mail from a thoughtful Slow Food Columbus member who types a quick joke, makes you laugh and extends an invitation to attend a chocolate tasting with Shawn Askinosie in the Jeni’s Ice Cream Kitchens. Well, you have to say yes, don’t you? I should say yes more often. Especially when you’re saying yes to hear what Shawn Askinosie has to talk about. Not only is he making remarkable chocolate that’s traceable from bean to bar, but he and his family are working hard to improve the lot of the farmers who grow the beans, the neighborhood and community in which the factory is located and heck, the lives of every single person who unwraps a bar of what I am starting to think is some of the best chocolate that has ever melted on my tongue. Shawn takes something that inherently makes people happy – chocolate – and then ups the ante by making it good for everyone along the supply chain. Good, clean and fair indeed. His noble work takes him all around the world to the cocoa farmers and co-ops that he trades with directly who reside in that narrow band 20 degrees to the north and to the south of the equator. There, in far flung locales from Ecuador to Tanzania to the Phillipines, Shawn partners, pays fairly and profit-shares with growers – many of them women – to produce not the rarest beans, but the ones handled with the greatest care. Askinosie beans are carefully raised, picked, fermented and then sun-dried in the equatorial heat. Don’t take my word that it’s these careful steps that makes Askinosie among the best chocolate made anywhere. Listen to David Lebovitz.